I think they're underestimating how many backers they're going to get in the last few days. This is going to be one hell of a dungeon. I'd like to see this be some kind of ultra-endgame challenge. Super crazy boss battles one floor after the next. "We're gunna need a bigger boat game engine." Honestly I might back this I could use me some more fantasy epicness, and the more I hear about this the more I like it. This alone convinced me to pledge 25 bucks. I want it to b a massive dungeon. I am going to laugh so very hard if this ends up as an incomplete mess riddled with bugs like virtually every other Obsidian game. Their defenders always blame the publishers, despite the fact that Obsidian have worked with multiple different publishers, all of whom have managed to extract stable functioning games from other developers. I guess this is their chance to prove those people right. Dungeon Siege 3 wasn't buggy. Apparently. It just had the unfortunate malady known as "being a Dungeon Siege game", and therefore was something I completely ignored. I'm loving the amount of PE coverage Escapist is doing, at least. Yet they've already made a non-buggy game using an in-house engine, and they're using the very stable Unity engine. New Vegas was no more buggier than Fallout 3- and it was built on Gamebryo, so you can't make that claim there. NWN2 was no more buggier than NWN1- not to mention that the Aurora Engine is incredibly unstable to begin with. So the two games that are considered to be the source of their 'issues' are Alpha Protocol and KotOR 2, the second was definitely the publisher's fault- knocking off 3+ months of development time hurts- and AP had it's problems, but it wasn't that it was buggy, it just needed more polish in it's AI and it's combat mechanics, which could be hammered out with more time. This. But that's just what happens when stupid people get emotional attachments to companies. Wait a sec... if it starts at 3 levels and gains a level every 2,500 backers but the max is 7 levels deep??? I think that is a typo. It was an example. The author said that if the project ends with 60k backers that it would get an additional 4 levels, hence 7 total. If they end up with 100,000 backers by some black magic and voodoo then they'd have to add 20 new levels which would make it 23 levels deep. Show of hands: Who here is reminded of that Megadungeon module (which I forgot the name of) you saw in your local gaming store? I think this is a really fun idea and very in keeping with the theme of the 'classic' fantasy rpg, they're hoping to evoke. Definitely an endgame challenge. Completing this dungeon should be a mighty undertaking. I assume that's official concept art? Looks like we might be getting guns. Good, means it wont be 100% clichÃ©d high fantasy then. As for the mega dungeon, I think this could be amazing, but I wont be too fussed if it doesn't come to pass. Optional dungeons are all well and good, but I rarely do them more than once unless there is a good storyline attached to them. They discuss setting specifics on the kickstarter page including discussion about guns. I generally don't like guns in high fantasy settings, but it sounds like they are going about an interesting way in handling them. I think so. They're setting their sights lower than the majority of the triple-A franchise hand-me-downs they've dealt with in the past. It's also a game-style they have a very comprehensive, collective experience with. As for their defenders: It seems less about justifying the undeniable problems, as loving the games the company makes despite them. For those with no patience for expensive games released with so many immersion-breaking imperfections, Obsidian is unquestionably a developer to be wary of. At worst, it's ineptitude at managing their timetable/resources, at best their aspirations exceeded their means of realising them. On this score though they do have a good track record of supporting their games as long as they can. NWN 2 for example; thanks to expansions Obsidian was releasing tweak and performance patches years after its release. If you're like me though, you have a high tolerance for bugs provided the story and world are compelling. Then you simply laughed your head off the first time you saw a floating radscorpion, or Sunny Smile's eyeless dog and got on with it. I mean love or hate the story and characters of KOTOR 2, it was an extremely ambitious tale to set in the SW universe and I love them for trying to tell it. The same goes for the majority of their games. I generally don't like guns in high fantasy settings, but it sounds like they are going about an interesting way in handling them. What did they say about them? I looked through all their articles and all I found was a confirmation that guns were in project Eternity, with a promise that more details about them would follow. They said they were supposed to be super low-tech, 10 years to reload style guns, which I am okay with I guess. 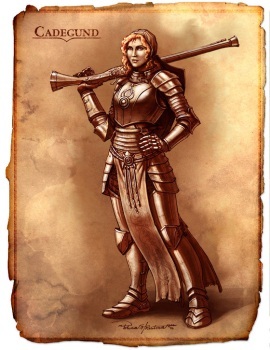 There's a bit somewhere in there that says mages started wearing traditional armor again because guns fire at a velocity too fast for traditional magic barriers to protect against. There's a quote somewhere where they talk about them being single-shot flintlock style weapons. Combined with the lack of industrialisation in the setting it makes them expensive and inefficient. Except in the case of magical shields (previously effective against medieval weapons), where the speed and penetration make them the ideal "mage-killers". The relatively recent appearance of these weapons and their wielders has led to wizards adopting amour to protect themselves. I'm willing to bet that this will end with 80,000+ backers (if its current trending is any indication), meaning this is going to be one insanely epic dungeon. Every piece of info I get on the game makes me more and more excited. i haven't a clue what you speak of, though would be interested to learn more. Well thats what I sort of expected from the guns (Aside from the Mage angle, that's an interesting take on it). I wasn't expecting automatic assault rifles or anything. Although I've been playing a lot of Arcanum recently, and I was sort of hoping the guns would be similar to that. Ah well. But 60 divided by 2.5 is not 4. EDIT: Nevermind I went and researched abit. I understand now. At current there is 50k backers os if they get another 10k then that would equal 4 new levels for every 2.5k new backers. The key word I glanced over was NEW. Okay...well, there was this book large enough to kill small game with that was called the world's most...SOMETHING...dungeon. (GOD, I hate not knowing the name!) It was a huge dungeon module made for D&D 3.5 that was billed as one of the largest dungeons ever made for D20. im heading to a game store right now, i'll see if i cant find out what it was.